So Much Like Sunshine It Feels Like You're On Vacation! Are you ready to have a sunny day, Everyday? 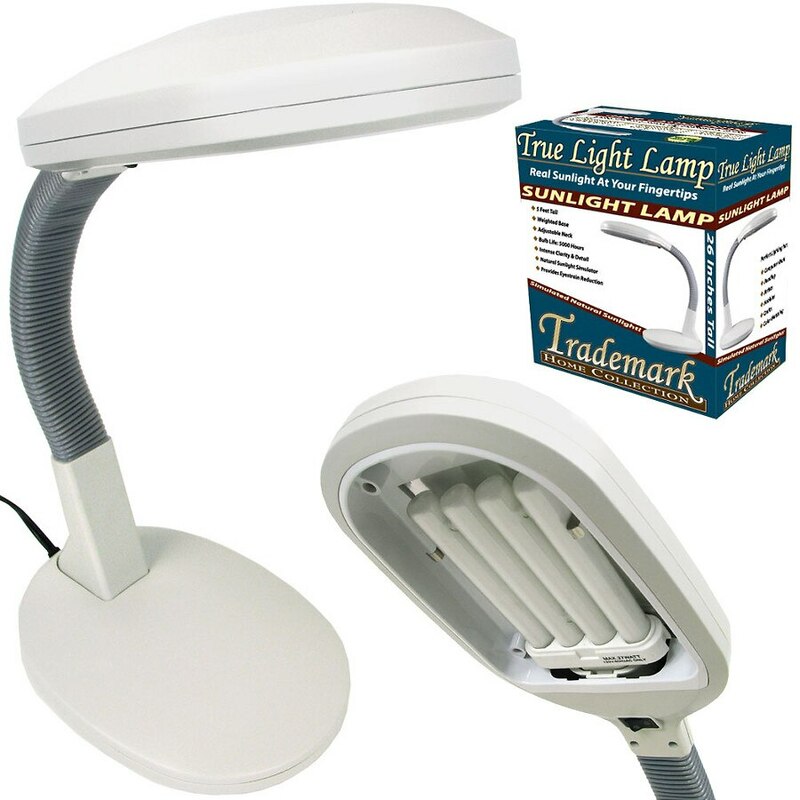 With the Trademark Home Collection Sunlight Desk lamp you can get that Inside! The Trademark Home Collection Sunlight lamp could be the most important advance in lamps since the invention of the light bulb! The New lighting technology simulates outdoor sunlight, which is balanced across the entire spectrum of color visible to the human eye. Everything seems so much easier to see. This is the clearest, brightest and most comfortable lighting we have found. Colors appear more vivid and true to life. Black and white contrast is heightened for easier reading. The soft and pure white light is easy on the eyes as it spreads to clearly illuminate your personal space. The flexible goose neck is fully adjustable to any angle. So you see more comfortably for reading, working, and all closeup tasks and hobbies. Colors will be more vivid. Better contrast for reading. Helps reduce eye strains. Sharp visibility for more detail. Glare free for computer use. What does the Trademark Home Collection Lamp look like? The Sunlight Lamp will look good in any room in the house or in the office. Why is the Bulb better than normal bulbs? Save$$$$ on your electric bills! The supplied high-tech 27-watt bulb, with a C.R.I. (Color Rendering Index) of 80-85, gives as much light as an ordinary 150-watt bulb, but uses far less energy. The bulb can last up to 5000 hours, 5x longer than other bulbs- for years of normal use. What is the Kelvin Temperature? The Kelvin temperature is 6500K. How many Lumens does it give off? The bulb gives off 1300 Lumens. We've nicknamed our Sunlight Lamp the "It's great to be alive lamp"! Many people say that bright sunny days seem to have a cheerful and energizing effect, but that dreary, dark days make them feel "blue". Now you can switch on the sunlight, indoors, everyday of the year! A word about this unheard of price! This lamp features the state-of-the-art performance you expect from the well-respected Trademark Home Collection name.